Veesible at latitudes atween +90° an −40°. Best veesible at 21:00 (9 p.m.) durin the month o November. 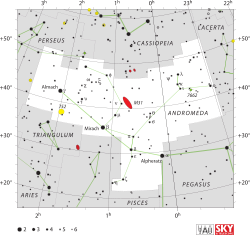 Andromeda is ane o the 48 constellations leetit bi the 2nt-century Greco-Roman astronomer Ptolemy an remains ane o the 88 modren constellations. ↑ Russell 1922, p. 469. ↑ Allen 1899, pp. 32–33. ↑ 3.0 3.1 IAU, The Constellations, Andromeda. ↑ RECONS, The 100 Nearest Star Systems. ↑ Bakich 1995, p. 54. ↑ Bakich 1995, p. 26. This page wis last eeditit on 20 August 2015, at 15:41.